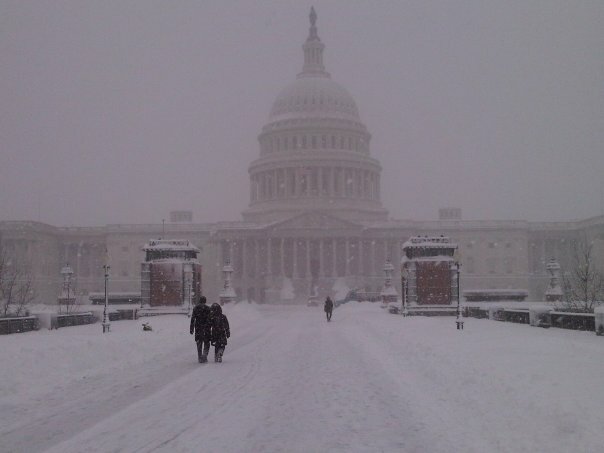 When I came to DC, I was told it doesn’t snow… now I find myself in the middle of what is called a “historic” snowstorm. Being a veteran of hurricane preparations, I was not accustomed to the sheer hysteria expressed on this site: http://snowpocalypsedc.com/. On Twitter there are three trending topics in the DC area about the storm, my favorite being #snowtoriousbig. Also Twitter has been my source for finding out where the best snowball fights are. The most happening spot right now is Dupont Circle where a snowball fight is occurring at 2 pm. The federal government is also in full operation today, so another option could be to brave the snow and go to the Smithsonian. I’m honestly surprised there is so much going on in the city today despite the grave names this blizzard is being called. I guess theres “snow” reason for me to be inside, haha.